gan: if you could tell me some things that would be good to have in there, that would be very useful. Most players grabbing stuff from the armory are ne'er-do-wells and not the HoS, so most player's perspective of what's in the armory is "what can I grab without HoS access". Generally players expect to find a box of stinger grenades and a pair of thermals just sitting around for the taking, and recently night vision goggles got put in the other armories. I dunno if there's enough room to really stick more stuff in though. Not sure if this really fits but it happened on Atlas so it probably goes here. No boards for replacing consoles. No disks for being a nerd on computers. A cache of materials to make computers would be nice. Barman cant get into his workplace because he cant access the maint door into the bar. Would there be any room for a chem dispenser in the medbay area? it would be super nice to have. In spoiler: Serious Fixed bug that does did very bad things to the engine. I've marked out in that rather eye-catching colour a collection of hot loop pipes. All of these pipes seem to be connected to the cold loop somehow: I put cold nitrogen in the cold loop and plasma in the hot, but the highlighted section of pipes began to fill with cold nitrogen over time. The big problem with this is that pump in the upper-right will make sure cold loop gas is constantly pumped into the hot loop. In my case, this ruined the engine, because the hot loop became filled with nitrogen. The best-case scenario is that the effectiveness of the engine is greatly decreased by the cold loop being constantly piped into the hot. I could not find a way to prevent this. In addition, the engine has no purge valves. Those are very useful and make the above bug much worse. Edit: Unrelatedly, the pod beacon outside the bridge is just generically named "warp beacon." When building windows from scratch or placing them on a grille, they use Clarion's and Destiny's directional thindows and weird blocky full windows instead of matching the perspective windows of the map. Newly built walls don't automatically orient themselves based on the surrounding walls. (02-16-2019, 04:15 PM)Avack Wrote: In spoiler: Serious bug that does very bad things to the engine. that's definitely because the pipes there overlap. It's very easy to break into the listening post ship through windows. Also toxins is still non-operational (as in the pumps aren't connected to any computer and there's no way to cool gases down). There's no television, so you can't watch VR or the helmet cams. Bar has no interior door for the barman to get behind it. AI cameras seem to leave a lot of small gaps in the view, even around the AI core. 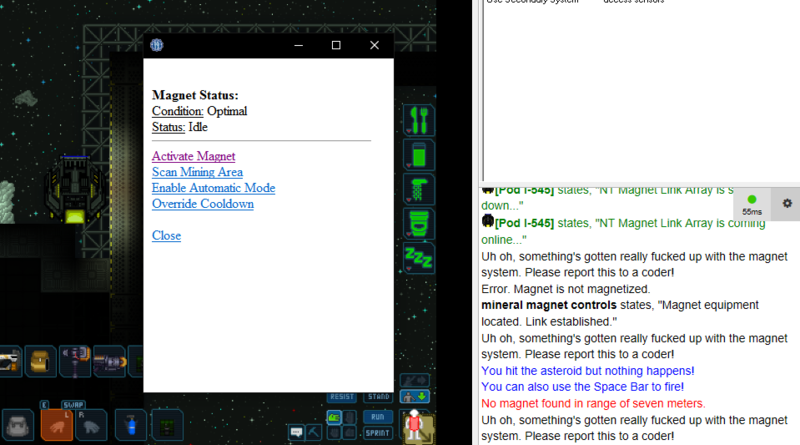 AI also can't check the southern solar computer or quantum telescope. Either the cooling loop is way to strong or the furnaces in Engineering are not putting any heat into the hot loop. Thinking they're either missing something or are of the generating type? (03-06-2019, 02:27 PM)Imps Wrote: Either the cooling loop is way to strong or the furnaces in Engineering are not putting any heat into the hot loop. Thinking they're either missing something or are of the generating type? They're the generator type; examining them reveals they "produce 5,000 W while active".